Brothers Daniel and Jordan Allott talk to Tyler Bridges, the 2017 Joan Shorenstein Fellow, about their documentary, The Race to 2020, which follows nine counties during Trump’s presidency. 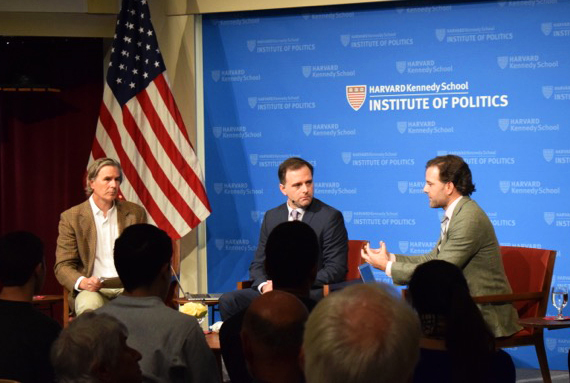 Brothers Daniel and Jordan Allott, who are currently working on a documentary to understand how President Donald Trump won the 2016 election, encouraged students to engage with citizens from across the political spectrum in a discussion at the Institute of Politics Wednesday evening. Jordan Allott, a filmmaker, and Daniel Allott, an editor for the Washington Examiner, are currently working on “The Race to 2020,” a project they said will seek to track the popularity of Trump’s presidency. Between 2017 and 2020, the Allott brothers said they will spend months interviewing and seeking to understand the political climate in nine counties across rural America that they deemed crucial to the 2020 presidential election. “They didn’t anticipate the rise of Donald Trump or his election victory,” he added. The brothers said they hope to capture on camera how Trump’s presidential campaign and administration have resonated with voters. “We wanted to give a voice to people in parts of the country that often feel like they’ve been ignored,” Jordan said. After almost a year on the project, the Allotts said their experiences have led them to conclude that voters find familiarity in Trump’s honest tone and genuine approach. They showed previews of their documentary, including a clip of Mark, a lifelong Democrat who had voted for Trump. “For a lot of voters, including some Obama voters, [Trump] was a candidate of hope,” Jordan said.